for Jan 25, Mar 1, Jun 7 & Jun 28, 2019 are now open for registration! Join us for a day filled with a little bit of everything! Today’s activities include a variety of different themed games, crafts and experiments. First your children will learn about the power and structures of electricity. They will be visited by Sensei Frank who will teach them the art of martial arts and self-defense. Our last activity of the day is fort building and fun in the outdoors, your children will explore their own space, relieve stress and create a work of art. Let’s travel back in time to the Victorian Village of Westfield and explore many of the 35 historic buildings, watch live historic reenactments and experience the charm and spirit of early Canada. We will learn about old and modern ways to make maple syrup. Your children will participate in an abundance of interactive stations to discover many tools and techniques used by indigenous communities and those of the past to transform maple sap into syrup! Today’s activities will involve Science, Technology, Engineering and Mathematics! We will also be walking to the Waterdown library where children can have some quiet time to look at books and time to work with a small group engaging in research for the theme of the day. There we will be exploring all aspects of STEM with interactive hands on activities, an abundance of books, iPad learning games and relaxing play time. When we return we will be building catapults, tunnels and bridges & practicing our art skills by carving and crafting with apples. Recommended: Weather appropriate clothing and outdoor footwear, indoor running shoes, water bottle, a nut and sesame seed free lunch. Note: *Healthy nut-free snacks are provided during 7am – 9am and 4pm – 6pm. Please review the information in the Tabs on the left before proceeding to the START REGISTRATION tab. All payments for our PA Day and Winter Holiday Programs are made by online Credit Card (PayPal), INTERAC E-mail Money Transfer, or Cheque within 2 business days of registering. Making changes is easy. But DON’T try to use the registration form link. 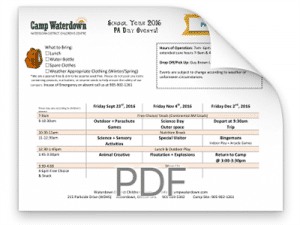 For changes (switches, cancellations and additions) you can either email us the change (make sure to mention the child’s name and program) at register@campwaterdown.com, OR you can use the CLICK to Change Request link found under each Registration in your Family Registration page. Space is limited so we recommend registering early. Making additions is also easy. You CAN use the same form link to ADD days not already booked. For adding days you can either contact us as above, or you can re-use the registration form. Just be careful to ONLY add the new dates and not select the days you already booked (the form doesn’t know that and you will be billed twice). Check your Current Registrations tab on your Family Registration page first to see what you have already booked and paid for. Some families choose to only select one or two days of program at a time. That is ok, just be aware that we may sell out space by the time the last PA Days roll around (particularly trip days). No refunds for cancellations will be given for Program Fees within 15 days of the Program Day start, and a 50% refund is given for cancellations within 30 days of the program start. Space in our programs is limited (and we adhere to Ministry guidelines for safe and effective Adult/Child ratios). We reserve the right to refund and cancel enrolments as needed if an accidental overbooking or program cancellation occurs. If the programs do fill up, parents will be offered a spot on our Waiting List; in case we are able to open another group, or spaces open up due to cancellations. Wait List priority is not guaranteed as we do not take deposits, and we normally offer available space first to families previously enrolled in one of our programs. Login or Create a New Membership (using the form at the very bottom of this page), if you haven’t already got on. Use the Program Registration links that will appear under your child’s name in your Child Record & Program Registration tab. Credit Card payments will be processed immediately through PayPal (you do not need a PayPal account). You will be given instructions on the form and in an automated confirmation email for submitting other types of payments. You may return to your Family Registration page at any time to review your registrations or to check on their status. This is also where you will find your Tax Receipts at the beginning of each year. First cancellation, change or withdrawal request 31 or more days before Program Day start: Free of charge, or a full refund given. Second or additional cancellation, change requests (not including additions): there will be a $35 administrative fee per family per request. Cancellation or withdrawal within 30 – 16 days of Program Day start: 50% of your fee will be refunded.